I have loved When Harry Met Sally for over half of my life. Seriously, the maths involved is scary. While watching this film recently, I realised that Nora Ephron's brilliant script offers a number of key life lessons. Harry first meets Sally when they drive from college in Chicago to New York together. In a scene that always makes me laugh, Harry eats a grape and then spits the seed out of the car window. Only the window isn’t actually open. Early on in the film, Harry (Billy Crystal) tells Sally (Meg Ryan): “empirically, you are attractive”. Sally is outraged that Harry is coming on to her despite being in a relationship with her friend Amanda. Harry tries to take it back. However, Sally informs him that he can’t because it’s already out there. This, of course, leads to their famous “men and women can’t be friends” debate. Lesson: Always think before you speak in case you can't take it back. In a brilliant scene that takes place during a Mexican Wave at a baseball game, Harry tells best friend, Jess (Bruno Kirby), the details of his separation from his wife. Ever the supportive friend, Jess comments: “Oh, that's harsh... I’m a writer, I know dialogue and that’s particularly harsh”. Lesson: If you want to know if you’ve been treated badly, ask a writer. 4. Good Taste And A Sense Of Humour? When Jess and Marie (Carrie Fisher) move in together, they have a classic argument about his wagon wheel coffee table. Marie explains that “everybody thinks they have good taste and a sense of humour but they couldn’t possibly all have good taste and a sense of humour”. Lesson: Never buy a wagon wheel coffee table. 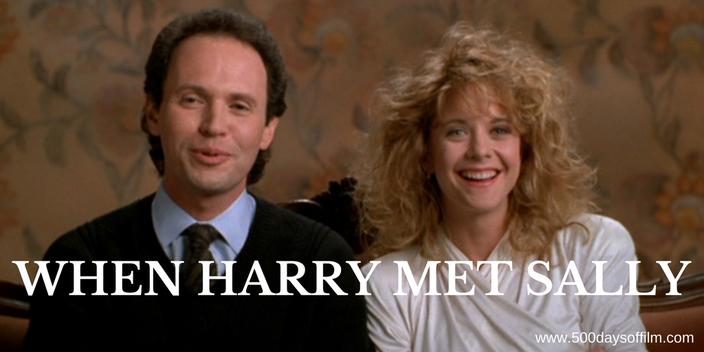 Thanks to Ephron's wonderful words, When Harry Met Sally is a timeless classic. However, the scene when they are playing Pictionary does hark back to a time when this was a novel dinner party game. It is not something to play if you are sensitive about your artistic skills as Sally finds when Jess can only guess 'baby fish mouth' when she was (clearly) trying to draw 'baby talk'. Lesson: Pick your dinner party games (and team) with care. Having become good friends, Sally criticizes Harry’s treatment of the women he dates. Harry cannot understand why she is upset about this. Sally explains that he is “a human affront to all women and I am a woman”. This, of course, then leads to the famous “I’ll have what she’s having scene”. Lesson: There's more than one way to win an argument. Sally turns food ordering into an art. That it takes her “an hour and a half to order a sandwich” is one of the things that Harry loves most about her. Asking for food to be served “on the side” is a very important thing for Sally - she just wants things the way she wants them. Lesson: It’s okay to ask for the things you want. When shopping for a moving in present for Jess and Marie, Harry spots a karaoke machine. Harry persuades Sally to sing Surrey With A Fringe On Top in a duet with him. However, enjoyment turns to horror when Harry sees his ex-wife and her new partner walking towards them. Lesson: Karaoke is never a good idea. Harry cannot believe that Sally has a dark side (“You probably dot your ‘i’s with little hearts”). However, he is proud of his dark side: “when I buy a new book I always read the last page first. That way, in case I die before I finish, at least I know how it ends. That, my friend, is a dark side." Lesson: Having a dark side is highly overrated - particularly if you like to read. Lesson: Always prepare to leave an entertaining answerphone message. Do you love When Harry Met Sally? If you do, what is your favourite scene? Love love love this post! I am gutted I hadn't read it until now! I can't pick a favourite scene because I just love it all. So many incredible moments! The karaoke scene is pretty fantastic and sad.